If you’re the type of baker who doesn’t stock apple pie spice, pumpkin spice, or other seasonal spice blends, don’t sweat it. You can easily make your own blends with common ingredients you’re likely to have. This fall spice biscotti uses apple pie spice, a mixture of cinnamon, allspice, nutmeg, and cloves. I recently bought a few small jars at the Container Store that I’ve filled with both homemade apple pie spice and pumpkin spice, so I can easily use either one in a recipe. Spice mixing is a bit of an art; you can stick with standard measurements, or explore a bit with your own ratios. I’m a big fan of cloves, so my apple pie spice is a bit heavier on cloves than the store-bought kind might be. The next time I make this recipe, I’ll likely divide my dough in half and bake it in two logs; it spreads a great deal when baking, which I wasn’t quite expecting. I may also add a bit more flour to the dough to stabilize it. Stay tuned! *You can make your own by blending 1/2 teaspoon cinnamon, 1/4 teaspoon allspice, 1/4 teaspoon nutmeg, and a dash of cloves. You’ll need to increase these measurements to get enough for 1 1/2 tablespoons, but it’s important to have the right ratio. In a medium bowl, combine flour, apple pie spice, baking powder, and salt; set aside. In a mixing bowl fitted with the paddle attachment, cream butter and sugars until light and fluffy. Add eggs one at a time, beating well and scraping the sides of the bowl between each. Add flour in two batches and mix to completely combine; stir in cinnamon chips. Dust your counter top with flour and turn dough out; it will be sticky. Sprinkle with flour and knead gently to bring dough together; you can add a few more tablespoons of flour without having to worry that your dough will be too tough. Roll into a log about 16 inches long (or divide in two – this is what I’ll do next time) and carefully place the log on your baking sheet; flatten to about 1 inch thickness. Note: the log will spread a good deal when you bake it, so you’ll want to place the log diagonally on your baking sheet to avoid it spilling over the edges. Bake for 35-40 minutes, until the edges are completely set and the middle is firm. Allow to cool for 10 minutes, then carefully move the log to a cutting board and slice it into 1-inch slices. Carefully place slices back on the parchment-lined baking sheet (they will be almost cake-like at this point, so handle them gently); you may need another sheet to fit all of the slices. Bake on one side for an additional 6-7 minutes, then flip and bake on the other side for 6-7 minutes. Gingerbread-themed baking continues with this gingerbread biscotti, which is adapted from Good Housekeeping’s basic ginger biscotti recipe. Although I think it still needs a bit more cloves, or perhaps nutmeg, this biscotti is easy to make and very tasty. 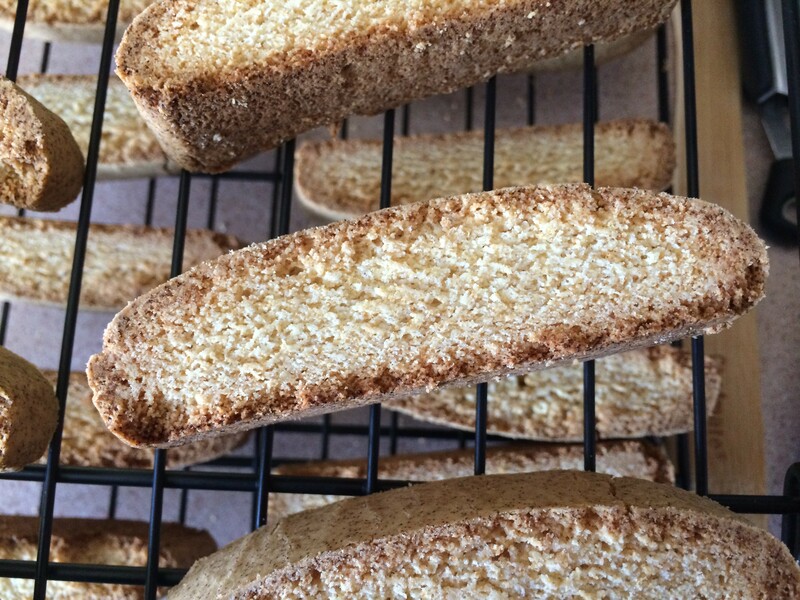 While biscotti can look fancy and might sound complicated to make, what with the baking, cooling, slicing, and re-baking, it’s actually quite easy. Biscotti also travels well, so it’s a nice idea for holiday gifts, or to send to faraway family and friends. In a medium bowl, combine flour, ginger, allspice, baking powder, and salt; set aside. In a mixing bowl, beat butter and sugars until light and fluffy. Add eggs, one at a time, beating well and scraping your bowl between each. Add flour mixture in two batches, beating on low to combine and scraping your bowl well. Sprinkle your counter top very lightly with flour and turn dough out, then knead one or two times to bring the dough together (it will be sturdy and easy to handle). Shape into a log, then transfer to your baking sheet and press it down evenly so your log becomes about 16 inches long. Bake for 30 minutes, until a cake tester comes out clean from the center; remove from oven and cool for 10 minutes. Transfer the log to a cutting board and, using a serrated knife, cut log into 1-inch slices (you could make thinner slices, but I wanted nice, thick pieces). Return to the baking sheet, placing them upright on their bottoms, and bake for another 10 minutes; lay all of the pieces on their sides and bake 2 minutes more, then flip over and bake on the remaining side for another 2 minutes. Remove from oven and cool on a wire rack. Store in an airtight container for up to 2 weeks. Anise is used in cooking, baking, and if you can believe it, medicine throughout the world. It can be found in everything from cookies to tea, and it’s one of my favorite flavors, particularly for biscotti. My grandma Zella, despite being Hungarian and not at all Italian, used anise for pizzelles. Because of this, I always think of anise as an Italian flavor, and I make sure I get a few plain anise and anise almond biscotti when I visit Enrico Biscotti in Pittsburgh’s Strip District. Almonds would be a great addition to this recipe, but it is delicious plain as well. As far as biscotti recipes go, I’d say this was among the easiest and most successful I’ve ever tried. In a mixing bowl, combine vegetable oil, sugar, anise extract, and eggs and beat on medium speed until combined. Add flour all at once; beat until combined. Dough will be very thick. Divide dough in half and roll into logs as long as your baking sheet. Press dough down to about 1/2 inch thickness. Bake for 25-30 minutes, then remove from the oven and allow to cool for about 10 minutes. Line a second baking sheet with parchment. Slice each log into 1-inch slices, then place slices on baking sheets and return to the oven and bake for another 6 minutes on each side. Fun with biscotti continues! Today’s batch is a spiced pumpkin variety, with lovely fall spices like cinnamon, cloves, nutmeg, and ginger to scent my kitchen. Today, I’ve become aware of why some biscotti are much crunchier than others: it’s all in the total baking time. Surely, total baking time will affect the texture of a treat; this makes perfect sense, but was not something I thought about until I experimented with two different biscotti recipes this weekend. Yesterday’s vanilla biscotti baked for a total of 50 minutes; 25 as a log, with 20 minutes for resting before the final 25 minutes for outer crisping. 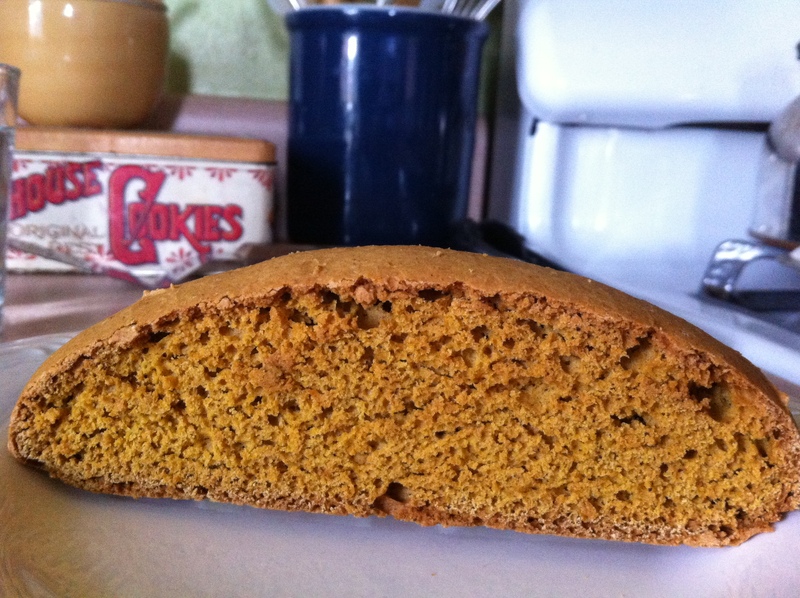 Today’s pumpkin biscotti baked for nearly two hours, so I wasn’t surprised to find it very crunchy, definitely more appropriate for dipping into coffee or tea than yesterday’s vanilla (though I’m sure you could dip yesterday’s vanilla into coffee or tea and enjoy it just as well). In a mixing bowl, combine eggs, pumpkin, and sugar; beat on low speed until well-combined. Add dry ingredients and mix until well-combined. Spoon dough onto the prepared baking sheet and, using a spatula, form it into a log of even thickness. Bake for 50 minutes; remove from oven and allow to rest for 10 minutes. Transfer the log to a cutting board and slice into wedges about 1/2 inch thick; you may need a second baking sheet lined with parchment to accommodate all of the wedges. Return wedges to the oven and bake for 25 minutes; flip each wedge over and bake another 25 minutes.